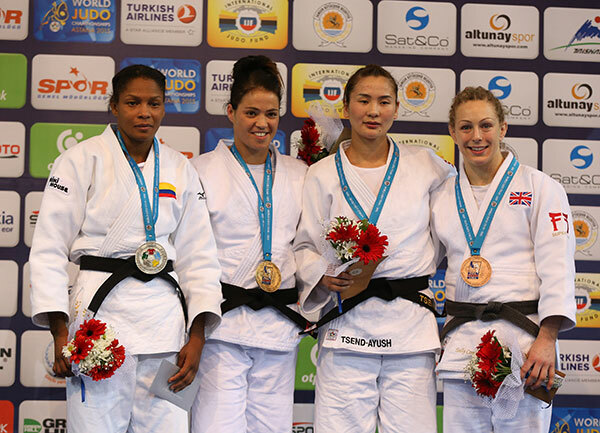 The Samsun Grand Prix 2015 produced a brilliant second day of competition as four categories (men’s -73kg and -81kg and women’s -63kg and -70kg) were in action at the Yasar Dogu Sports Arena. 169 athletes competed in front of an enthusiastic all-red-dressed public, who came to support their home favourites and to cheer for the beautiful judo that has been delivered by the competitors for the last two days. Then Mr. Akif CAGATAY KILIC and Mr. Naser Al-Tamimi, jointly declared the Samsun Grand Prix 2015 in Turkey officially open. The final opposed the top seeded athlete Anicka VAN EMDEN (NED), bronze medallist of the 2013 World Championships (Rio) and the third seeded athlete of the category, Hilde DREXLER (AUT), her teammate and second seed, Kathrin UNTERWURZACHER (AUT) having been eliminated during the preliminary rounds. The first strong attack came from the Dutch side, VAN EMDEN launching a right-side shoulder technique for no score. The second attack of the Dutch athlete was more precise, her sode-tsuri-komi-goshi being rewarded with a yuko, while DREXLER was also penalised for passivity. Despite a stronger kumikata (grip), the Austrian was incapable of finding any opportunity to score and was even penalised a second time, VAN EMDEN easily controlling until the final gong. Anicka VAN EMDEN said: “I am very happy. I felt very good all day long. I was the top seeded athlete of the category. But it doesn’t guarantee the victory anymore because the level is very high. It feels really good to have a perfect day and to stand on the top of the podium at the end. I won several medals over the past months, but I am back on the top and I am happy“. In the first bronze medal contest, Ekaterina VALKOVA (RUS) and Alice SCHLESINGER (GBR), who is now competing for Great Britain, were opposed for a place on the podium. SCHLESINGER demonstrated her perfect technique, throwing her opponent with a superb koshi-guruma technique, VALKOVA landing in a bridge position. This attempt from the Russian to escape, automatically gave the victory to the British, as bridge position is not allowed. The second Dutch athlete, Juul FRANSSEN, and the second British fighter of the category, Gemma HOWELL, met for the last spot on the podium. A few seconds were necessary for FRANSSEN to score a first waza-ari with an opportunistic counterattack. Then she just had to control her opponent to make sure that she was the one the step on the podium. With no surprise, top seeded athlete and two-time world champion, Yuri ALVEAR (COL), entered the final of the women’s -70kg category. Competing now for Israel, Linda BOLDER joined the Columbian hero to determine who would top the podium on the occasion of the second day of competition in Samsun. With her red back number, the current world champion is easily recognisable, but this did not intimidate Linda BOLDER who executed a perfect counterattack (ko-soto-gari) after the o-uchi-gari attempt of ALVEAR. Within a second, the Columbian was on her back, with force, speed and control, and Linda Bolder had a huge smile on her face. Brazilian, Maria PORTELA, winner of the Moscow Grand Slam in 2012 and today world number 22, and TSEND AYUSH Naranjargal (MGL), who won the Ulaanbaatar Grand Prix last year, also qualified for the final block to determine the destination of the first bronze medal. Maria PORTELA quickly scored a waza-ari, but she was not able to control TSEND AYUSH Naranjargal, who put tremendous pressure on her shoulders and the Brazilian was penalised four times, for hansoku-make. 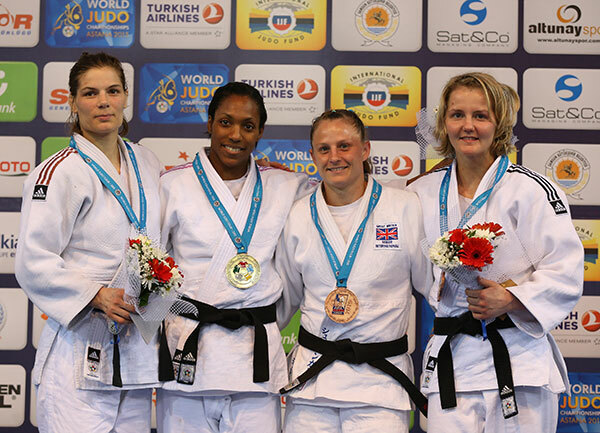 The second bronze medal fight opposed Roxane TAEYMANS (BEL) and Sally CONWAY (GBR), silver medallist on the occasion of last year’s Baku Grand Slam. Roxane TAEYMANS was rapidly penalised with a first shido for stepping outside on the fighting area, followed by two other penalties, when the British athlete was only penalised two times, enough for her to reach the podium of the Samsun Grand Prix this year. 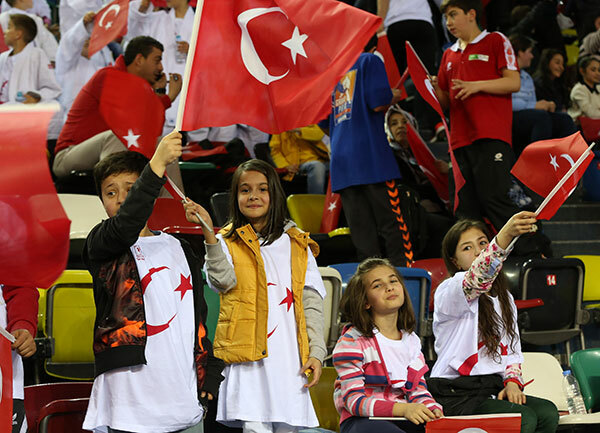 To the delight of the numerous public of the Yasar Dogu Sports Arena, Hasan VANLIOGLU (TUR) created a big sensation by entering the final of the day in the men’s -73kg category. For that he successively defeated SUN Shuai (CHN) by ippon, Igor WANDTKE (GER) by penalties, Akil GJAKOVA (KOS), Nugzari TATALASHVILI (GEO) by yuko and the top seeded competitor Dex ELMONT (NED) by penalties. In the final he was opposed to Rustam ORUJOV (AZE), winner of the Baku Grand Slam in 2013. The most awaited fight of the day could begin under the hurrahs of the public, but after three minutes, Hasan VANLIOGLU was in a difficult situation having been penalised three times, while Rustam ORUJOV had only received two shidos. The sound level raised again, when the Azeri fighter also received a third penalty. When the gong echoed in the venue, both athletes had three shido. It was time for the golden score, where everything is possible. 27 seconds were necessary for Rustam ORUJOV to suddenly surprise his opponent with a quick left handed uki-goshi for ippon. 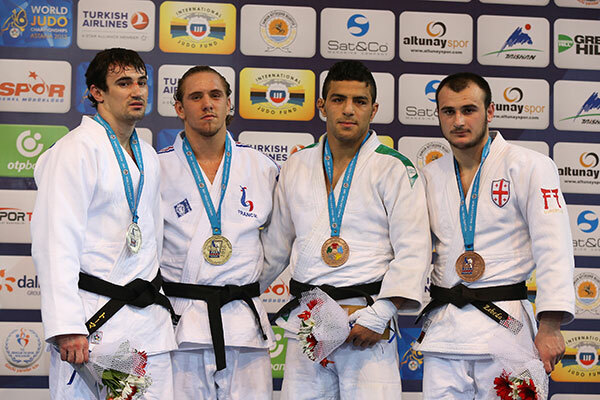 In a beautiful sportsmanship gesture, ORUJOV raised VANLIOGLU’s arm to celebrate the local silver medallist. 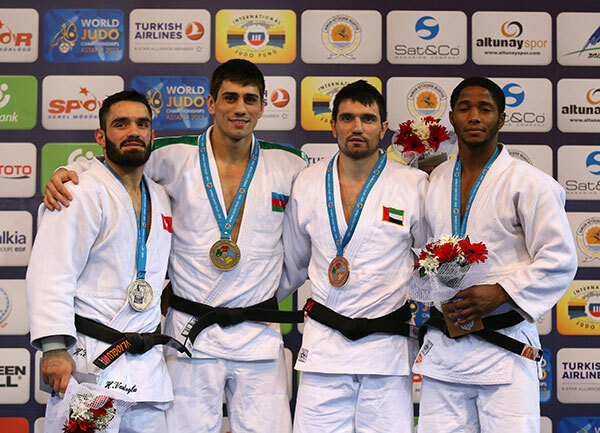 The first bronze medal fight opposed the winner of Ulaanbaatar Grand Prix in 2014, Nugzari TATALASHVILI (GEO) and the bronze medallist of the last World Championships in Chelyabinsk, Victor SCVORTOV from the United Arab Emirates. Totally controlled by the strong kumikata of the Georgian, SCVORTOV was not able to engaged a single powerful attack and was even penalised with a shido, which looked enough to give the win to TATALASHVILI until the last three seconds. SCVORTOV launched an attack for no score on the edge of the fighting area but was able to immediately follow it on the floor to catch his opponent with an unstable immobilisation. However, this was enough for SCVORTOV to win one more medal for the United Arab Emirates on the occasion of a major international event. The second bronze medal fight would secure another medal for the Dutch delegation as the two teammates Sam VAN T WESTENDE (NED) and Dex ELMONT (NED) faced off for the right to step on the podium. World number one ELMONT finally won the bronze with two waza-ari giving no chance to VAN T WESTENDE. The last category of the day was the largest of the whole competition as 58 athletes were in action. Among the favourites, the 2013 world champion from France, Loïc PIETRI, and the finalist of the last Tokyo Grand Slam in December 2014, Sergiu TOMA (UAE) were the strongest and entered the final, even if their way to the podium was not an easy one. In the absence of world number one and Georgian hero, Avtandili TCHRIKISHVILI, PIETRI was the top seeded athlete of the category. Despite the fact that he was looking a bit slow and tired, the French fighter secured four victories: Aliaksandr STSIASHENKA (BLR), UNGVARI Attila (HUN), ZOLOEV Vladimir (KYR) and Ushangi MARGIANI (GEO) while TOMA won against Andranik CHAPARYAN (ARM), Ivan VOROBEV (RUS), OTGONBAATAR Uuganbaatar (MGL) and Saeid MOLLAEI (IRI). The first five minutes consisted of a kumikata battle, both athletes perfectly neutralising one another. Three more minutes were necessary to finally discover the last winner of the day. Totally exhausted after more than eight minutes of battling, TOMA tried a last leg attack, immediately countered by PIETRI for ippon. The first bronze medal contest opposed the winner of the 2015 first Grand Prix in Düsseldorf, Joachim BOTTIEAU (BEL) and MOLLAEI, Saeid (IRI). 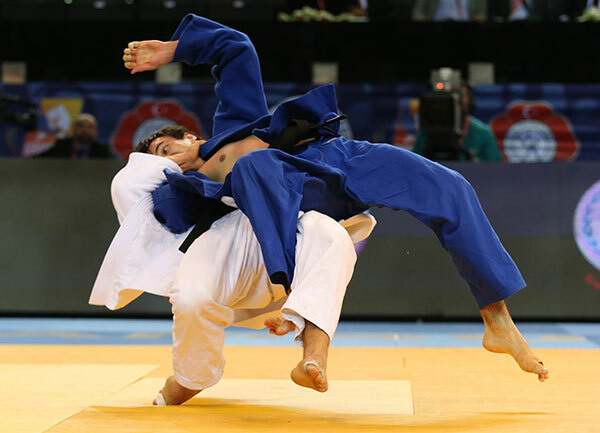 The Iranian secured his place on the podium with a waza-ari scored with a variant of kata-guruma. In the second bronze medal fight, number 19 in the World Ranking List, OTGONBAATAR Uuganbaatar (MGL) faced the Tbilisi Grand Prix 2015 silver medallist, Ushangi MARGIANI (GEO). After one minute and thirty seconds, MARGIANI scored the first waza-ari with a counterattack. One minute later, it was OTGONBAATAR’s turn to score waza-ari with a superb shoulder movement. One minute later, a clear koshi-waza technique for ippon offered the victory to MARGIANI.